Application Note 43 – Singlet oxygen reaction in continuous flow, an example of an ene reaction. 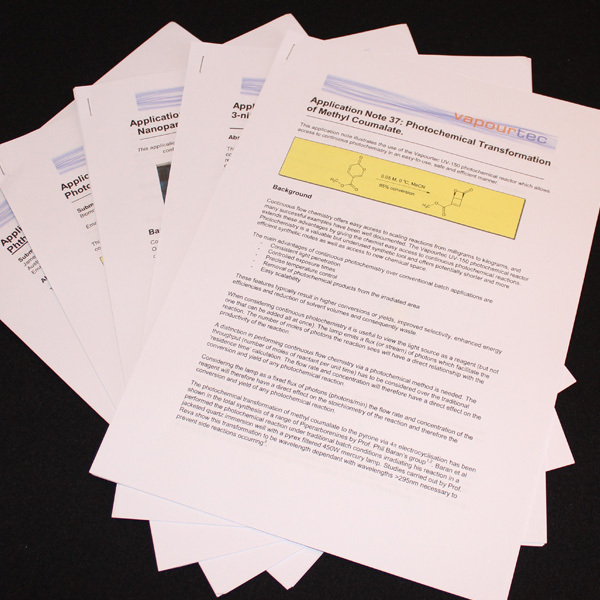 This application note demonstrates the use of singlet oxygen in flow. A range of parameters are investigated that determine the conversion and throughput. The ene like reaction of singlet oxygen with citronellol is used as a model. The versatility of the V-3 pump is showcased by the simultaneously pumping of both the reagent solution and gaseous oxygen. The bi-phasic gas / liquid mixture enters the reactor in Taylor flow. On exiting the UV-150 photochemical reactor the bi-phasic flow is no longer seen as the majority of the gas is consumed in the reactor. Further, by using a variable backpressure regulator, reaction parameters are controlled individually and optimized. Significant advantage is shown over traditional batch singlet oxygen reactions in which some reaction parameters are difficult to control.